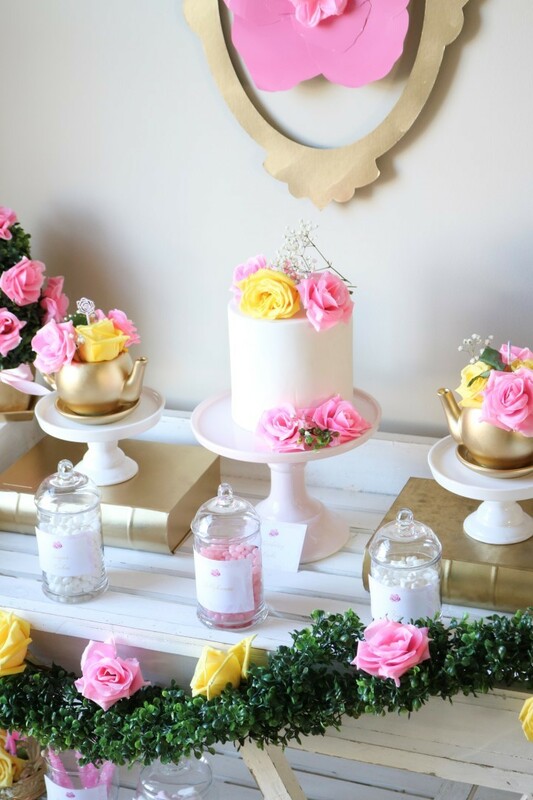 Be sure to keep an eye out for some of our favorite party details! We loved settin the table with a mix of soft yellows, pinks and gold tones for a fun twist on the typical yellow and red you often see in Beauty and the Beast themed parties. 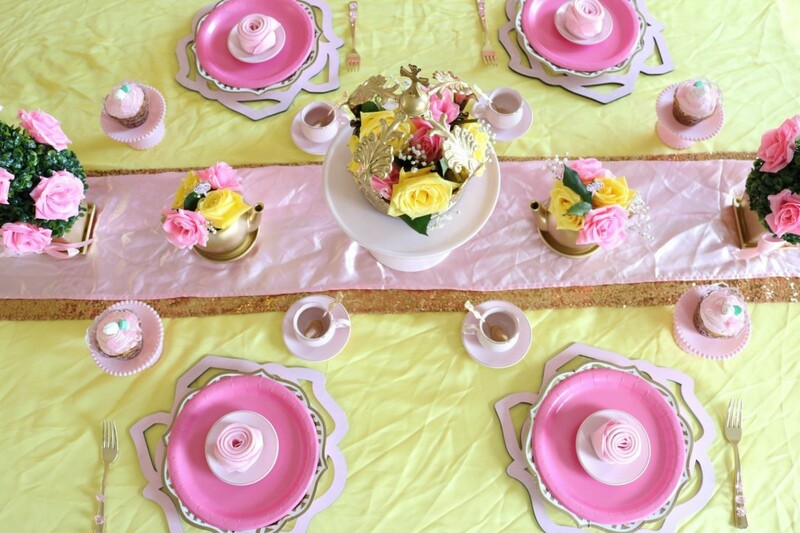 We emphasized the rose in pink tones and the yellow and gold details were inspired by Belle’s beautiful ball gown from the classic ballroom scene. 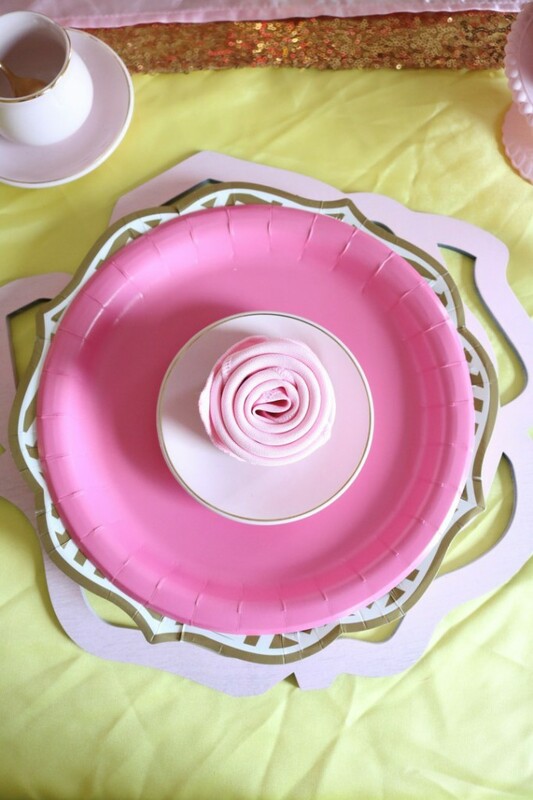 Each setting rested on a custom rose charger from our friend Lauren of Ten 23 Designs. We then folded the napkins into a rose fold for a fun detail. The napkins rested on a layered place setting with supplies from Oriental Trading Company. The gold utensils were acentuated with rose beads for a fun detail. Each guest of course had the cutest tiny tea cup we ever did see! 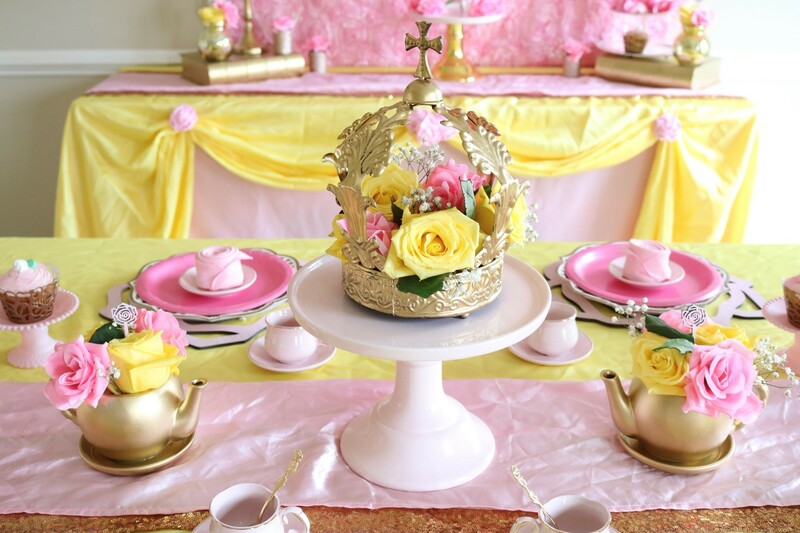 We really wanted a garden feel for this sweet princess party so we added plenty of fresh and faux flowers to a crown centerpiece as well as tea pots that we painted gold for a elegant look. We love to mix fresh and faux flowers to save on budget and they can be reused over and over again for all types of party themes. Rose stir sticks from Tn23 Designs were displayed i the teapots for a romantic and feminine detail. We love the elegant and soft look of these florals paired with the gold tiara for a chic look. This was such an easy diy, we simply spray painted a thrift store find and added floral. Voila! 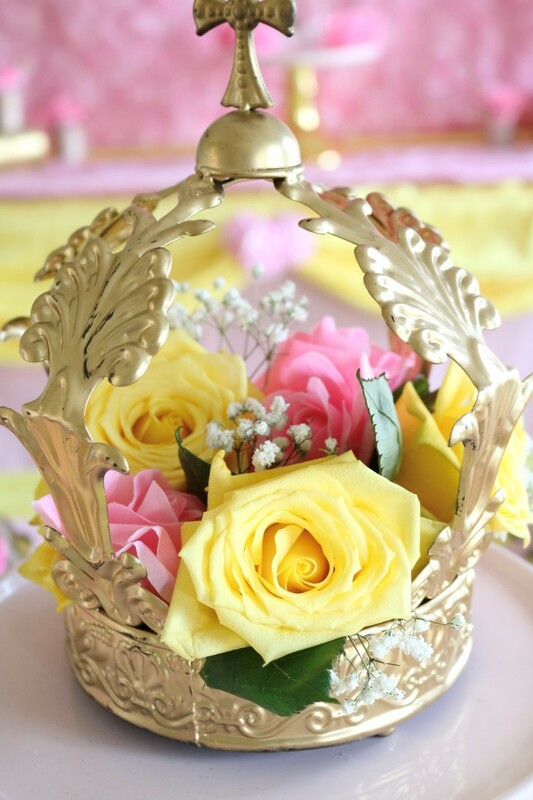 The perfect princess centerpiece! 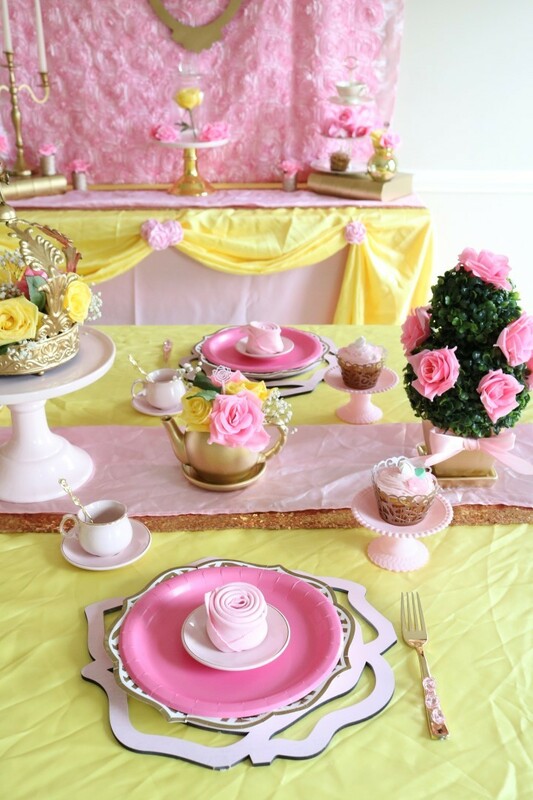 Every princess loves hosting tea, so for this garden themed tea party, we wanted to incorporate plenty of teapots! This reference to Mrs Pots was a simple diy. 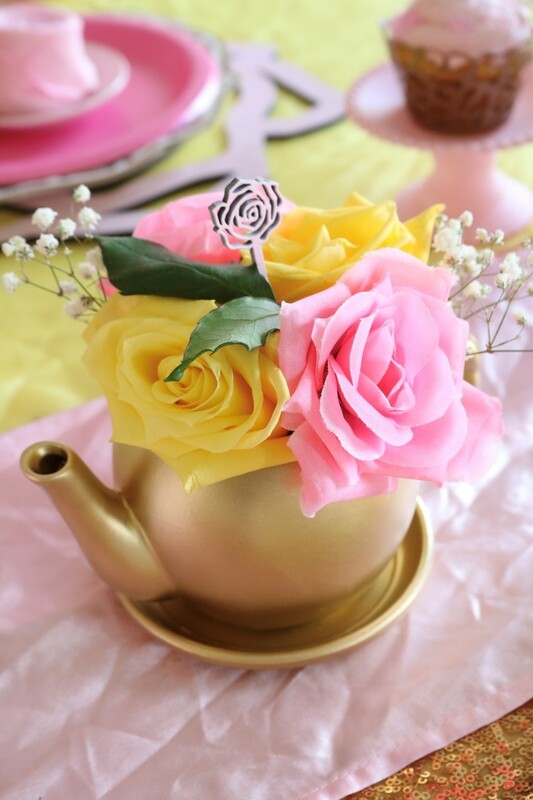 We spray painted ceramic tea pots from Oriental Trading Company and filled our pots with gorgeous flowers for a royal look. 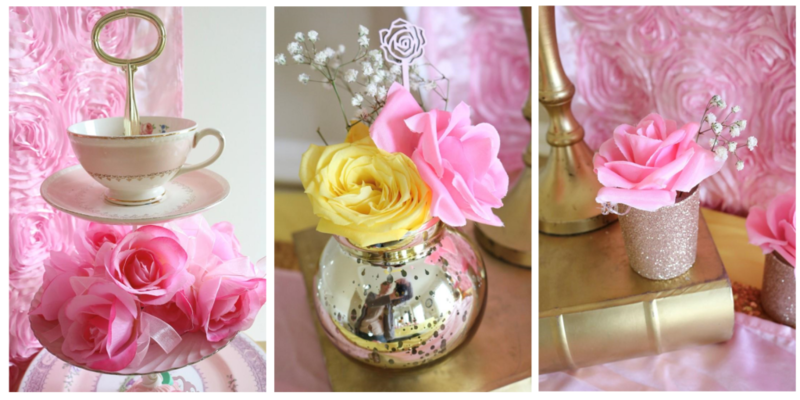 We just love the mix of yellow and pink flowers! For even more garden details we whipped up these gorgeous topiaries to add to our centerpiece. There are so simple to make with just a few basic supplies we found at Oriental Trading Company. These faux topiaries took only minutes to make, added a gorgeous detail to our tablescape and was inexpensive! We really loved how these place settings turned out. You can host an elegant party despite using paper products! If you follow our parties, you know that we love to layer our plates for a high end look on a low end budget. It really dresses up the place setting and literally take no extra effort! This sweet place setting looked absolutely perfect on our table! Every party calls for some delicious sweet treats and our Candied Cupcakes were perfect for this party! 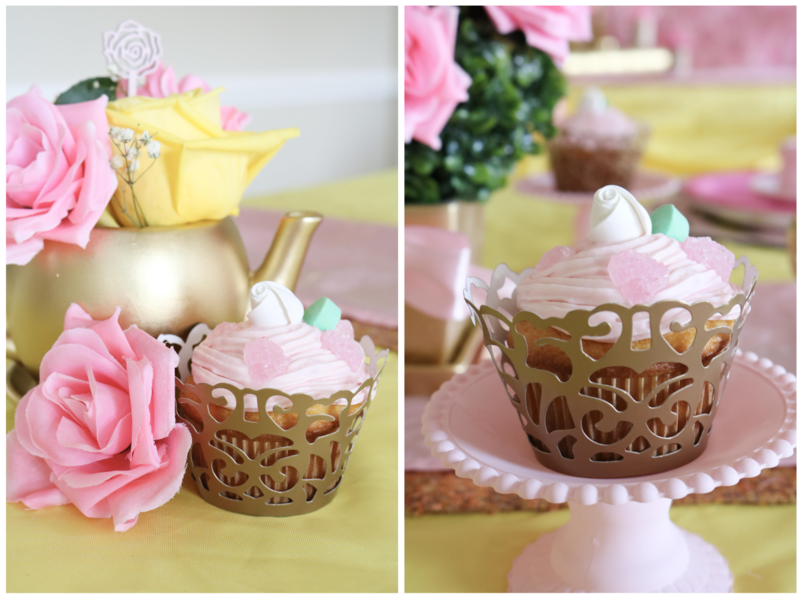 Topped with pink icing, roses and rocky candy, these sweet cupcakes looks stunning wrapped in gold lace inspired cupcake wrappers! Our pint sized guests loved nibbling on these precious cupcakes! 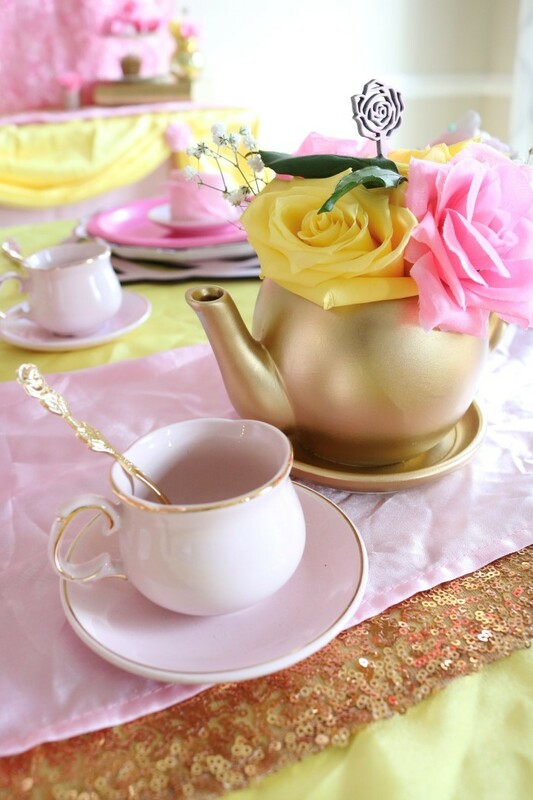 We served up “tea” in these sweet little pink and gold tea pots that we found on Amazon. They were perfect for tiny hands, are heat safe and look oh so sweet filled with pink lemonade and a rose shaped teaspoon. They looked adorable placed next to our place setting and really completed the look. Our side table was dressed to represent Belle’s classic draped ball gown. 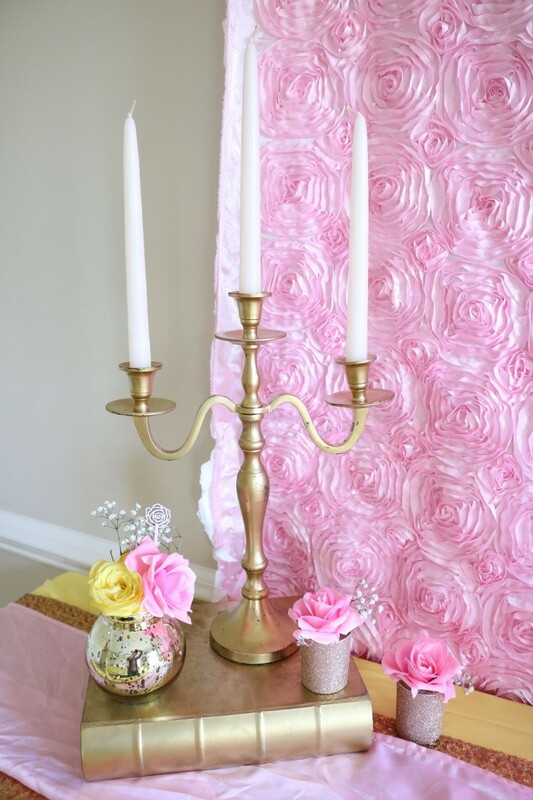 We simply pinned up our linens into a draping pattern and secured them with faux roses. 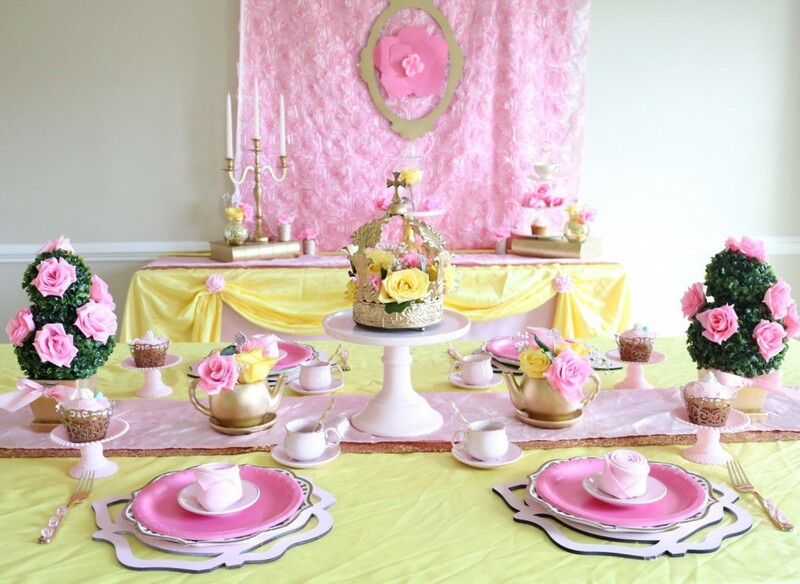 We lined the table with gold sequin and pink satin table runners for a sophisticated look. 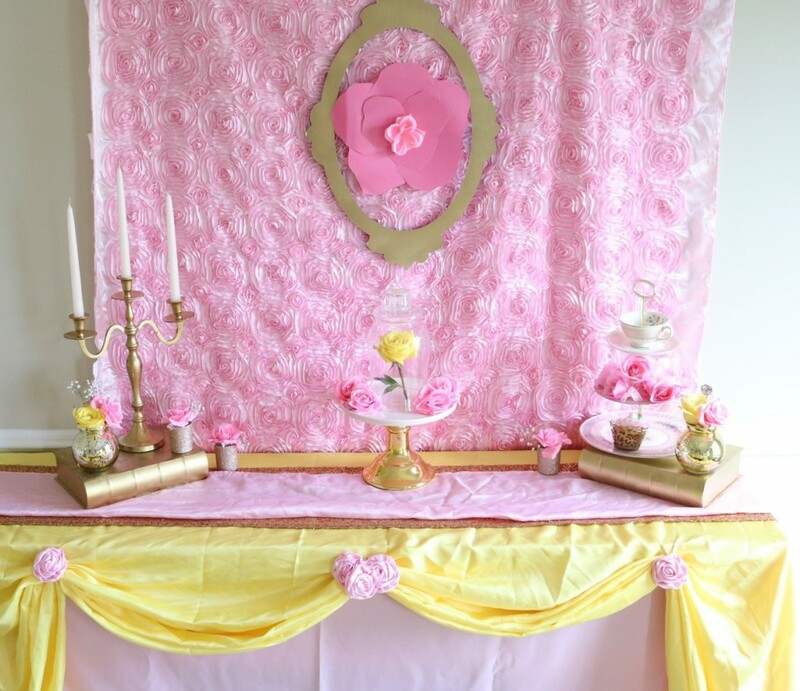 A simple backdrop was constructed out of paper plates, faux flowers and rosette fabric. 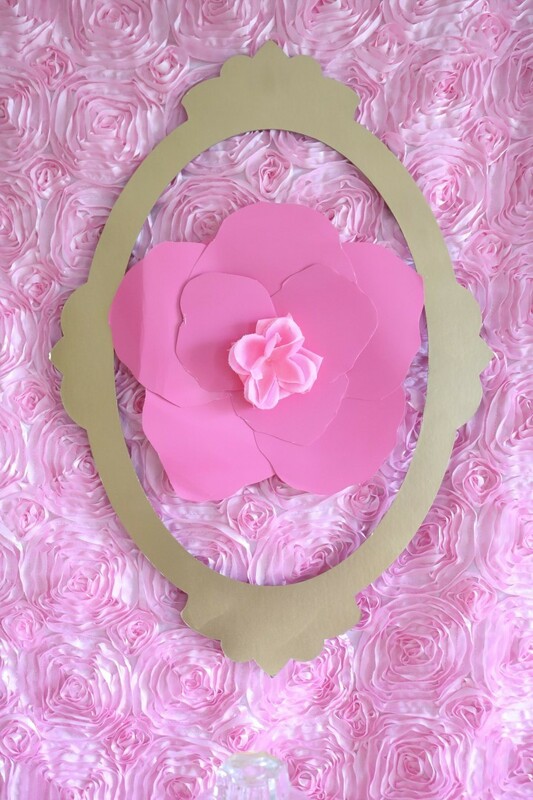 We framed out our rose for a princess look. We even had a beautiful gold candelabra to represent Lumiere on our side table. He was paired with rose gold glittered votive holders and gold mercury glass vases for a chic look. The decor was stacked on gold books to pay homage to Belle’s love of reading. We also included more tea inspired details in the form of vintage tea pieces. This added a really fun feel to the table. The ultimate Beauty and the Beast symbolism of course comes in the form of the cloched rose, and we loved this beautiful detail! We created this cloched rose using a real yellow rose and a glass hurricane vase flipped upside down with a detail on top. It was the perfect centerpiece for our side table. 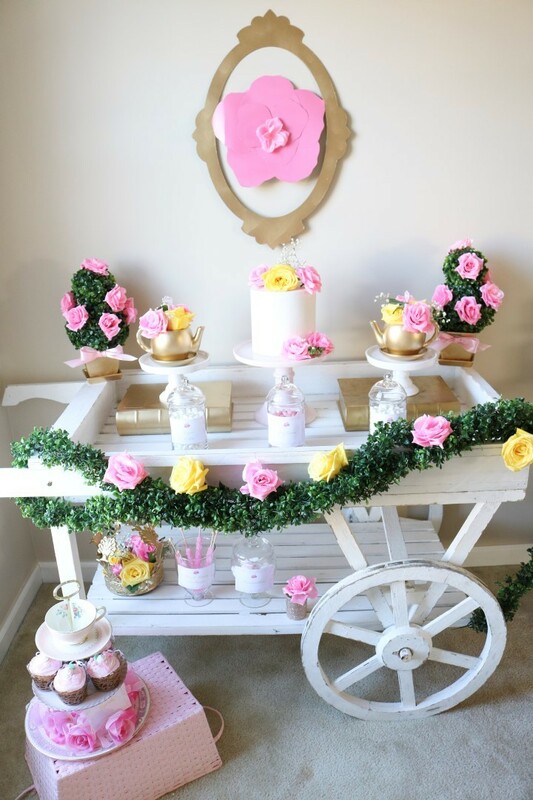 We loved displaying additional sweets and decor on this garden inspired tea cart! It added a beautiful rustic feel to our sweets and way a huge hit with our guests! 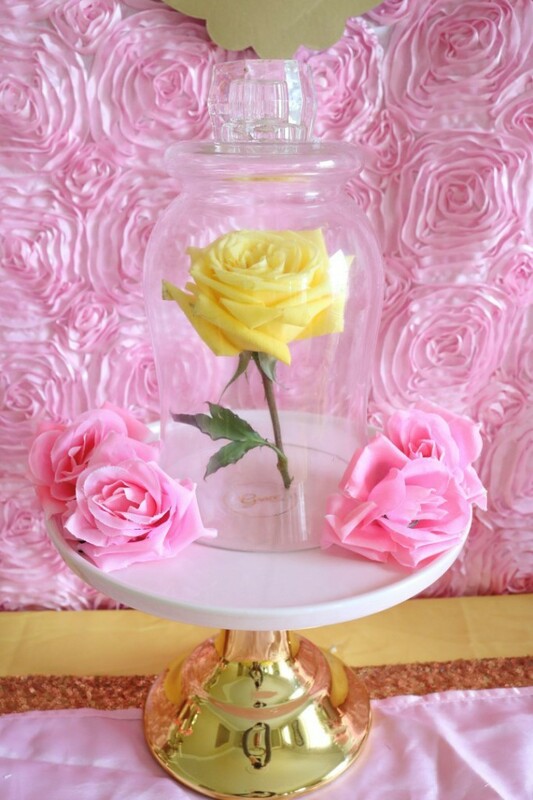 Looking for more Beauty and the Beast party ideas, decor and diy ideas? 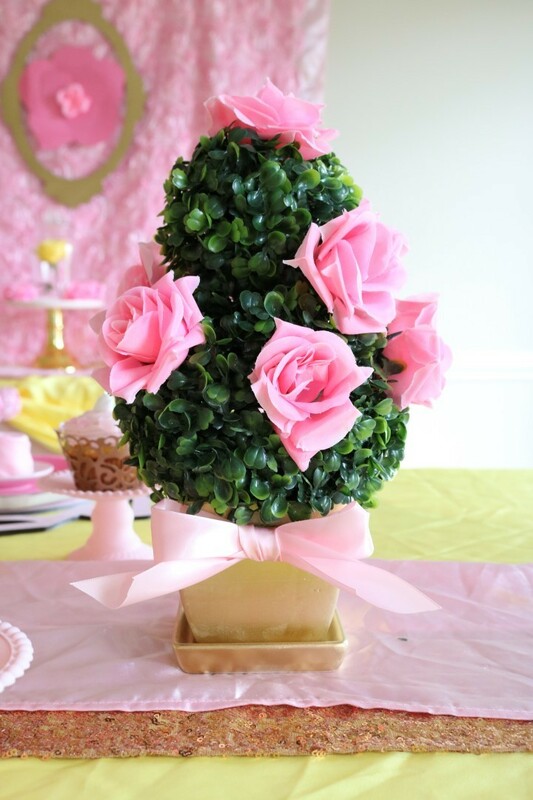 Be sure to check out our DIY Boxwood Topiaries, Rose Rock Candy Cupcakes, DIY Tea & Candy Cart and Princess Tiaras!